To make way for athletic fields and grounds adjacent to the new $200 million NewtonNorth High School, Costello Dismantling began demolition of the former NNHS in June 2010. A fairly routine, albeit difficult, demolition component was coupled with a massive environmental remediation scope of work to create an extremely challenging overall project. This challenge was compounded by a sensitive community relations element and discoveries made during the course of demolition which required a unique and inventive engineering solution. 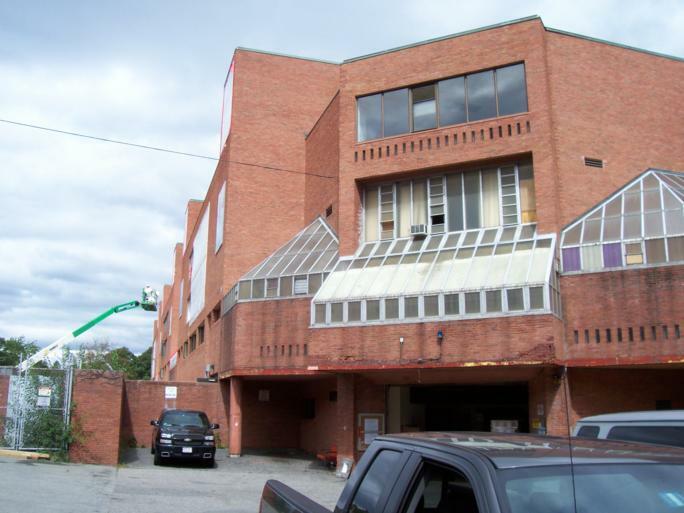 Built in 1974 when the conventional construction technique was structural steel framework, poured in place floor slabs, masonry block interior partition walls and masonry block and brick exterior walls, NNHS is located on a square block parcel in a densely-populated residential suburb of Boston, Massachusetts. The site is surrounded on three sides by residential neighborhoods and on the back side by the new high school and athletic fields. The entire community was very active and concerned with all aspects of the project. A monthly public meeting was held the first Tuesday of each month at 7:00 P.M. to address fears and concerns that the neighborhood had about asbestos, noise, dust, vibration, traffic control, parking and disruption of their daily life throughout the duration of the project. These important meetings mitigated community concerns. All the interior block walls had been identified as being asbestos-contaminated from overspray of fireproofing applied to the structural steel during construction, which had permeated the inner cavities of the masonry block walls. The spray-on fireproofing had also settled on top of ceiling tiles throughout a large portion of the building, obviously necessitating careful abatement. In addition, a large percentage of the flooring and/or flooring mastic in the classroom areas contained asbestos. Window caulking and roofing mastics also tested positive for asbestos. The extraordinary volume and extent of asbestos materials was a daunting challenge to address in the bidding and development phases of the project. To meet an accelerated overall project schedule, the building was carefully divided into 8 work zones, allowing multiple environmental sub-contractors and our demolition crews to work simultaneously. The site required packaging all asbestos debris in double-lined, labeled and sealed gaylord (3’ x 3’ x 3’) heavy cardboard boxes. The loaded boxes were taken from containment zones into decontamination chambers, then by forklift to load-out areas. To insure optimum shipping weights, each gaylord box was weighed, manifested and loaded into 53 ft. box trailers for shipping. During the course of the project, more than 650 trailer loads were shipped in this manner. Prior to structural demolition of Zone 1, we performed preliminary inspections of the exterior walls to fully understand the remaining structure. The pre-bid asbestos survey and as-built structural drawings from the original construction, upon which the bid had relied on, did not indicate fireproofing in the exterior wall areas. We quickly discovered the same asbestos fireproofing overspray present in the interstitial space of the masonry block as well as through-wall asbestos containing flashing at each floor level of the school. Further testing quickly revealed that asbestos was pervasive in almost all of the exterior walls. Removing the exterior walls now as asbestos-containing material dramatically changed the demolition methodology. Full containment, negative air on the work zones during abatement, and packaging and loading out asbestos debris in cardboard boxes, and loading box trailers was now required. Winter was quickly approaching and the early Spring scheduled completion of work was now out of the question. The task at hand became to engineer a system that could safely and cost-effectively allow us to handle this excess material while affecting the schedule as little as possible. The first approach that we looked at was to erect scaffolding around the entire 4-story building and shrink-wrap the building envelope to allow removal of the exterior walls within negative air containment. Wrapping the building had been the only successfully-executed practice that had been previously approved in Massachusetts for similar circumstances. The price for the change order work came in in excess of $5M. Five million dollars was beyond the budget, contingency and rainy day fund authority, and the city would have to consider finishing all interior abatement, then securing the school building until funding could be realized in subsequent years. The new athletic fields to be built on the footprint of the old school would have to be postponed, which was a very disagreeable but real possibility. We immediately began to think outside the box to come up with a different solution. The first seed of an idea came with the thought of somehow maintaining the exterior brick course in place, to provide containment without a complete building wrap, while removing the concrete block from the inside. The problem would be that the brick course was incapable of supporting itself with the masonry courses and steel ties removed. Our structural engineer, project manager and entire staff spent countless hours poring over the problem for a solution. The solution evolved and was refined many times into a system of exterior supports that braced the brick façade against the interior floors. The supports would be installed before interior masonry block removal, then removed and reinstalled as each floor of a zone was abated. This also allowed the brick façade to be recycled rather than disposed of as asbestos-containing debris, a savings of at least 25% of disposal costs. After approval of a funding request that shaved $2M off the original estimate, abatement and subsequent demolition began, with two sub-contractors working from each end of the building towards the middle. The work proceeded flawlessly. We sequentially soon had zones released for demolition and had demolition teams taking down zones of the building at the north and south ends simultaneously. A second team prepared and shipped 4,000 tons of structural steel while a third crew removed and processed concrete slabs and foundations, much of which was used for on-site fill requirements. The discovery of asbestos fireproofing in exterior walls pushed back the start of demolition by 4 months, but an expertly organized and executed demolition plan released critical areas of the work zone to the developer only one month after the original milestone, a full month ahead of the revised schedule. Grass will be growing on new athletic fields before the start of school in the Autumn, putting the finishing touches on the City of Newton’s new flagship school.